James R: I often feel a little guilty these days when writing On The Pull - over the last two years my pull-list has shrunk considerably, due mainly to me not getting much from the Big Two, and I'm not sure if I'm picking up enough stuff to justify my spot here! This week, however, there are a couple of books that make me think there are shoots of recovery on my denuded list. 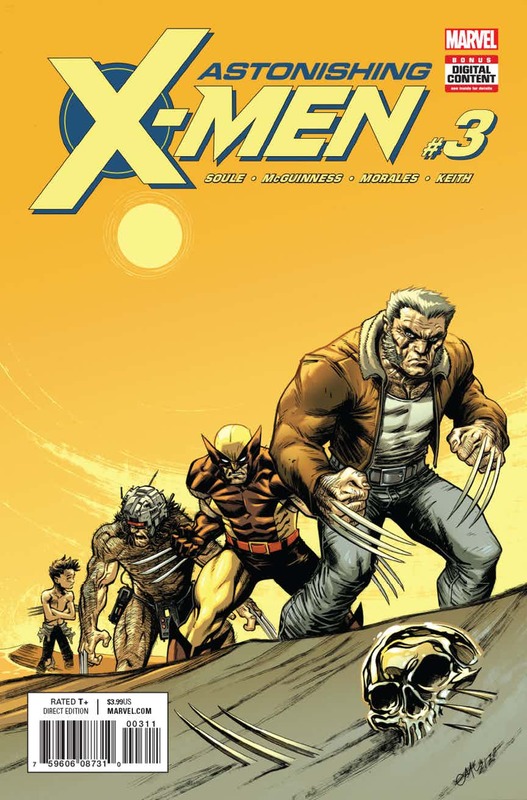 Firstly, from Marvel, I am picking up Charles Soule's great-thus-far Astonishing X-Men. I really like the X-Men as characters but feel they've been victim to some questionable choices by Marvel editorial for a few years. Astonishing X-Men has certainly started out strong, and it's nice to look forward to an X-book once more. The other huge part of my fanboy heart beats for Star Wars, and whereas I felt the main ongoing monthly from Marvel sadly lost its initial magic, I can't resist picking up Captain Phasma #1. Ahead of the stormtrooper commander's return in Episode VIII, Marvel are revealing just how she escaped Starkiller Base, and where she's at prior to The Last Jedi. A four-part miniseries is certainly much kinder on my wallet too! Finally, from DC, I will be picking up Batman #30. Tom King's run on the Dark Knight's adventures has been somewhat of a curate's egg thus far - there have been individual issues that have been majestic, but the larger arc (including the current 'War of Jokes And Riddles') isn't quite as compelling as I hoped. But this week's is another one of King's single-shot must-reads. Kite Man has been a running joke in King's run thus far, and this issue 'The Ballad of Kite Man' promises to be a winner. So it's a small but nicely formed pull list for me this week - whatever you're picking up, happy reading! Jo S: Summer draws to a close and I’m diving into a new job this week, so my pull-list is a dinky one by comparison with most of the summer’s bumper lists, at a bijou five in total. Three Marvel favourites appear: All-New Guardians Of The Galaxy has been consistent fun so I'm looking forward to issue #9, Hawkeye reaches #10 in one of my favourite series of the year and the non-standard curiosity that is Black Bolt hits issue #5 - each of these has been like a study in peculiarity, leaving me intrigued for the next. My final two are issue #1s: I’m giving Bombshells United a try, as I'm very drawn to the style of these series but haven't sampled anything for myself as yet, and Made Men; a story of the descendants of Frankenstein’s monster and a Detroit-based murder mystery rolled into one: “Guess who’s getting the gang back together?” was too good a tag to miss.